Trenton Doyle Hancock (b. 1974, Oklahoma City, USA) has, since childhood, been interested in issues of morality and ethics. He grew up in an all American household governed by Christian ideals and over a lifetime has developed his own parallel (sometimes contradictory) value system. What began simply in his youth necessitated by a desire to manage a seemingly endless amount of resources, questions and life information, has continued as a grand narrative into adult life, pulling in a deepening understanding of life's thematic complexities, current events and existential conundrums which have come to form the complex narrative basis for Hancock’s paintings, drawings, murals, theatrical performances and film. This, combined with constant inspiration drawn from the world of toys, classical comic book imagery, pop art and American cinema (especially the horror genre), as well as the aesthetic of classic prints (Durer, Goya, Daumier, Kathe Kollwitz, etc. ), creates Hancock’s unique approach. Hancock uses the flux of artistic endeavour to fuse together a world and reality that he can both occupy and constantly modify. In short, he creates his own personal narrative between good and evil. Each new work serves as a progressive contribution to this saga portraying the birth, death, afterlife and dreamlike states of a range of characters, particularly the Mounds (half-animal, half-plant like creatures) and their aggressors, the Vegans, existing in a universe governed by two opposing forces: the stark, paternal Loid and the colourful, maternal Painter. Since 2010, Hancock has also begun to incorporate the figure of the artist himself into his creative universe, allowing him to intervene, take ownership and comment upon the narrative, and also remain outside of it. It is him—but also not him. By having him show up wielding his giant pencil, he takes the form of an artist's signature and represents a revelatory and revisionist attitude or director's commentary; Hancock (the character) becomes a vehicle aiming to provide a new insight into the creative intentions of the work whilst it is in progress. 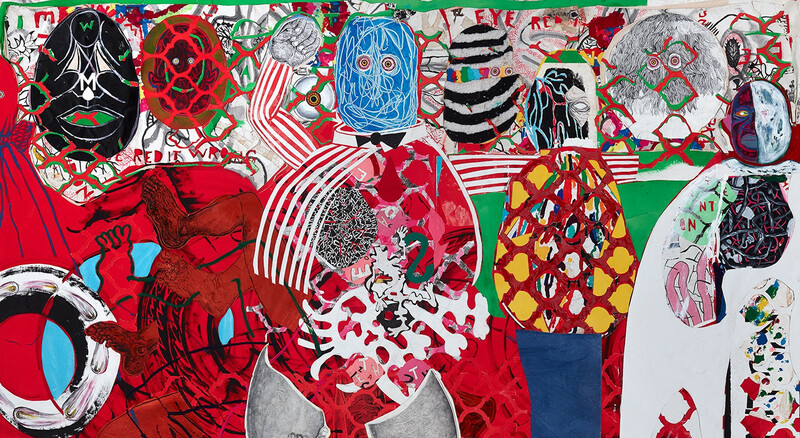 In Hancock’s latest body of work (first exhibited at Hales in 2015), the storyline has shifted once more with the merging of the creative energies of Loid and Painter and the introduction of a series of new symbolic motifs, plotlines and characters. Hancock's works were featured in the 2000 and 2002 Whitney Biennial exhibitions, becoming one of the youngest artists in history to participate in this prestigious survey. 2008 saw the premier of Cult of Color: Call to Color, an original ballet commissioned by Ballet Austin and based entirely on the narrative and characters developed by Hancock. In 2013, Hancock was selected as the recipient of the Greenfield Prize awarded in conjunction with The Hermitage Artist Retreat, resulting in a solo exhibition at the Ringling Museum in Florida and the development of a film, What the Bringback Brought, and a new series of accompanying action figures and dolls. His work has been the subject of solo exhibitions at The University of South Florida Contemporary Art Museum, Tampa (2010); The Savannah College of Art and Design, Savannah and Atlanta (2010); The Weatherspoon Museum, Greensboro (2010); Institute for Contemporary Art at the University of Pennsylvania, Philadelphia (2008); Olympic Sculpture Park at the Seattle Art Museum, Seattle (2010); The Fruitmarket Gallery, Edinburgh (2007); and Museum Boijmans Van Beuningen, Rotterdam, The Netherlands (2007); The Contemporary Arts Museum, Houston (2001); The Modern Art Museum of Fort Worth (2001); The Museum of Contemporary Art, North Miami (2003). Skin And Bones: 20 Years of Drawing, a retrospective of Hancock’s drawings since the mid 90s, has been shown in major institutions including Contemporary Art Museum Houston, Akron Art Musem Ohio, the Studio Museum in Harlem, New York City and Virginia Museum of Contemporary Art. Hancock’s public works include a site-specific installation at the Dallas Cowboys Stadium, Seattle Art Museum’s Olympic sculpture Park and Houston’s Hermann Park. Hancock's work is in the permanent collections of several prestigious museums, including the Dallas Museum of Art, Dallas; Museum of Fine Arts, Houston; Modern Art Museum of Forth Worth, Fort Worth; The Museum of Modern Art, New York; Whitney Museum of American Art, New York; The Metropolitan Museum of Art, New York; The Studio Museum in Harlem, New York; Brooklyn Museum, Brooklyn; San Francisco Museum of Modern Art, San Francisco; Akron Art Museum, Akron; Museum Boijmans Van Beuningen, Rotterdam, The Netherlands; and il Museo di arte moderna e contemporanea, Trento, Italy.